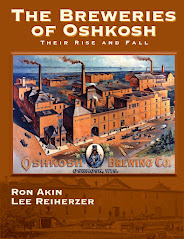 Today we branch out beyond Oshkosh for a detailed survey of the history of beer and brewing in Appleton, Wisconsin. The following article was written by Brian Zenefski. Brian has been researching the history of brewing in Appleton for more than 30 years. What he presents here is surely the most thorough exploration of that history currently available online or in print. Immediately following the article, Brian tells of his sources and years of research in this area. 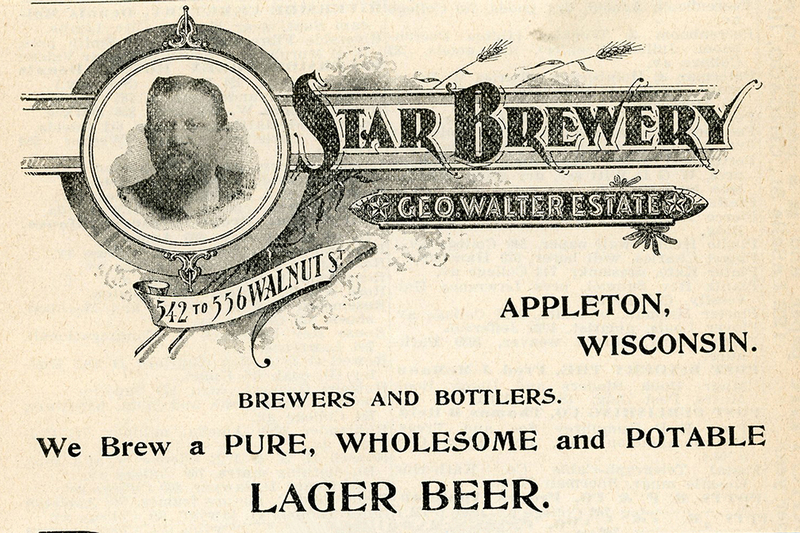 Prior to 1918 Appleton, Wisconsin had two breweries. The first was The Appleton Brewing & Malting Company. 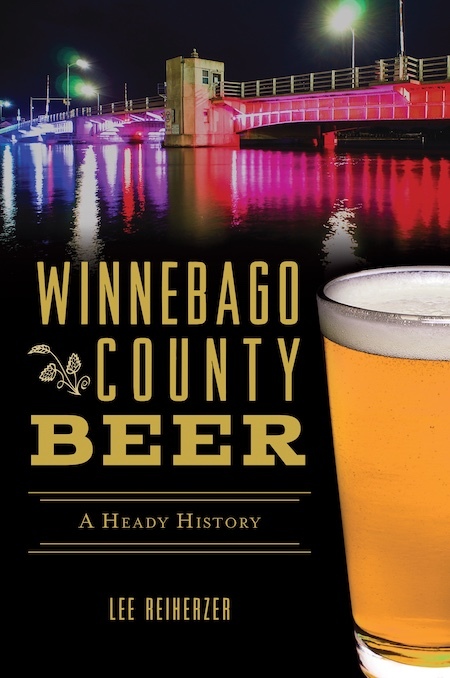 This was also the first brewery built in Outagamie County. It was located at what is now 1004 S. Olde Oneida Street, currently the location of Stone Cellar Brewpub. This brewery was founded in 1858 by Anton Fischer, a German immigrant who had settled in the area to help with the building of the Fox River canal system. Fischer’s brewery produced a beer known as Mellow Brew. In 1860, this brewery was sold to Carl Muench, who had worked as a foreman at Joseph Schlitz Brewing Co. in Milwaukee. Carl created what was to become an Appleton institution by adding the popular outdoor beer garden next to the brewery. A devastating fire destroyed the brewery in 1884. It was rebuilt soon after. 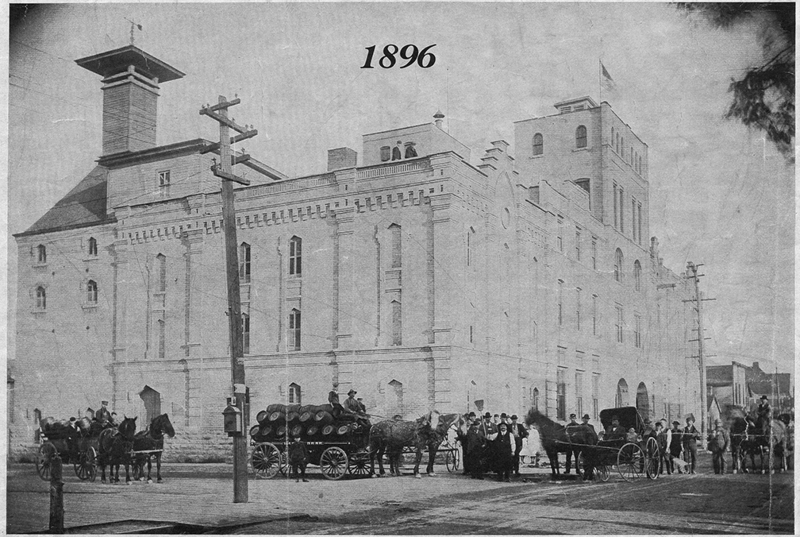 The second Appleton brewery was launched on August 11, 1862 by George Muench, Carl Muench’s brother. Previously to starting this brewery George Muench had worked at his brother’s brewery. The George Muench brewery was located on the corner of Walnut and Lawrence streets, closer to what became downtown Appleton. The brewery was sold to George Mayer in 1868, who then sold it to Michael Fries in 1870. Fries passed away in 1876 and the brewery passed on to his children, Mrs. Susan Kohl and Mrs. Elizabeth Kohl. George Walter was born in Wurtemburg, Germany on January 26, 1848. He received a liberal education at school in Wurtemburg, and was apprenticed to learn the trade of brewing at the age of 15. At the age of 21, Walter served in the Franco-German war. After the war, he resumed work in various German breweries. George wanted to improve living conditions for himself and decided to emigrate to America in 1873. He went to Milwaukee and found employment at the Phillip Best Brewing Company, which would later be renamed Pabst Brewing Co.
After leaving Milwaukee, George worked for two years in Whitewater, Wisconsin as a brewery foreman. 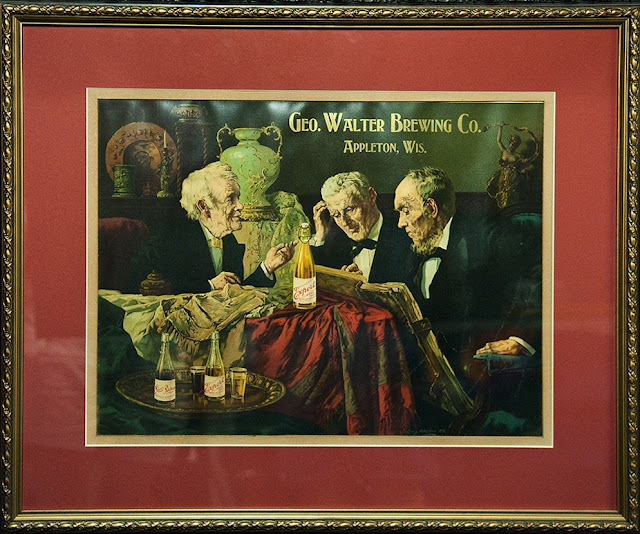 In 1876, George Walter accepted a position in Carl Muench’s brewery in Appleton. There he worked as an assistant to Muench for four years. During this period, Walter saved his earnings, putting aside quite a sum of capital. He was planning for his future. In the meantime, the Kohls had sold a half-interest in the Walnut Street brewery to Werner Winz. In 1880, Winz sold his interest to George Walter. 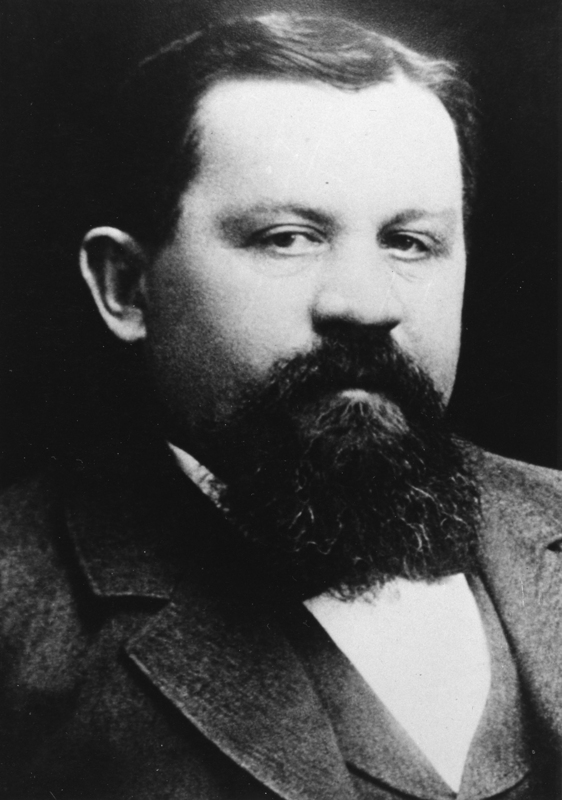 In 1885, Walter became the sole owner of the brewery after purchasing the remaining half-interest from the Kohls. The brewery then became known as The George Walter Star Brewery. 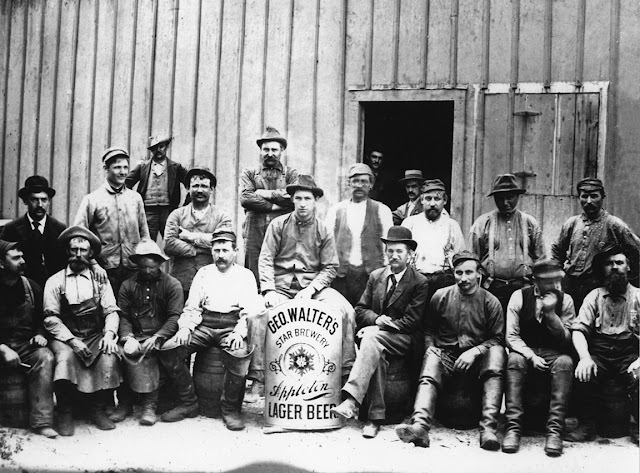 Workers at George Walter's Star Brewery, circa 1885. 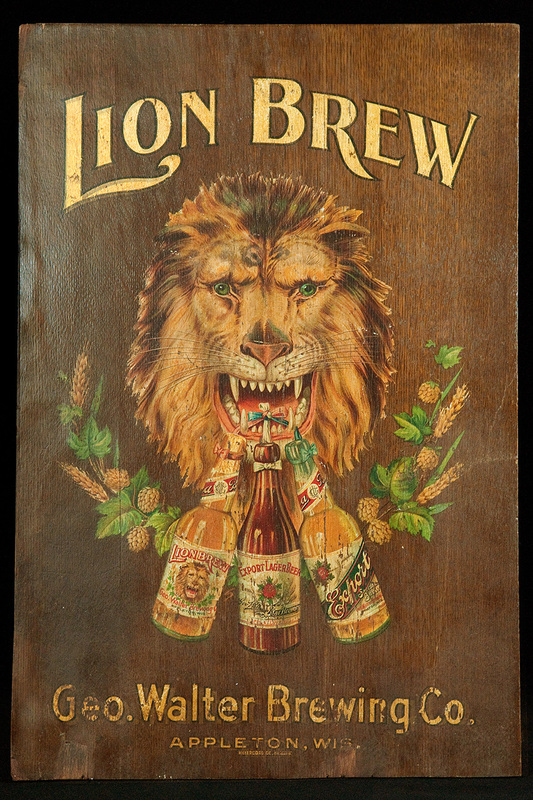 The George Walter Star Brewery brewery produced several beers that included Export Lager, Export Special, Expert Special and Lion Brew. It was through George Walter’s expertise and good business sense that the annual output increased from 4,000 barrels per year to some 30,000 barrels of beer annually by 1895. George Walter passed away on May 25, 1899. The cause of death was diabetes, for which there was no treatment at that time. His heirs continued to run the business until 1903 when it became a corporation organized under the laws of the State of Wisconsin. 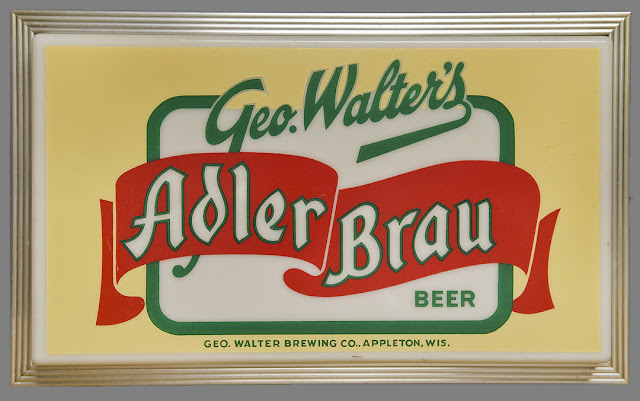 It was at this time that the brewery name was changed to The George Walter Brewing Co. and the name Adler Brau was adopted for its beer. 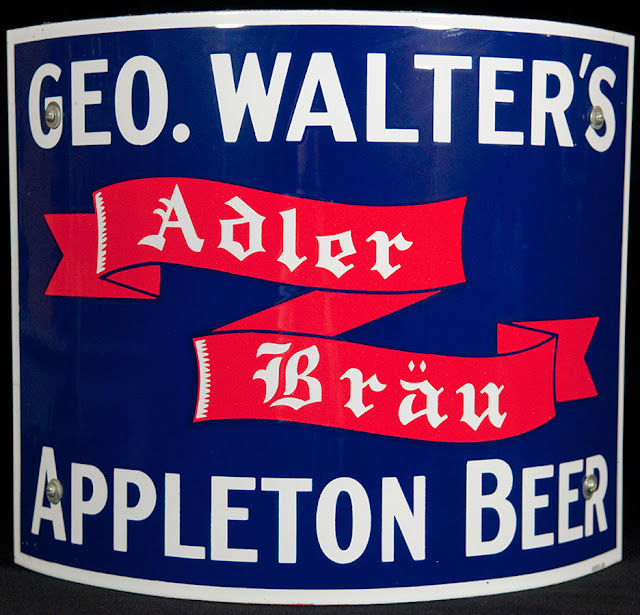 Adler Brau would remain the trademarked name for the brewery’s flagship beer for the remainder of its existence. 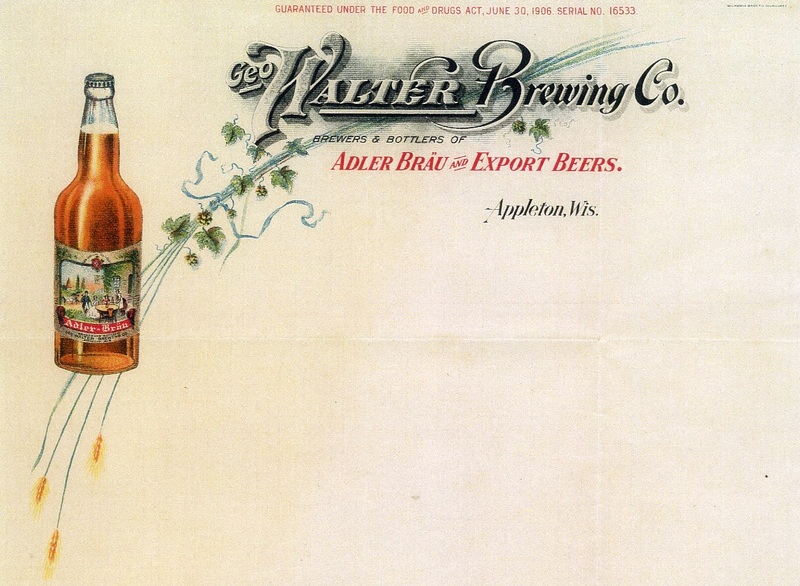 Letterhead used by the brewery in the early 1900s. 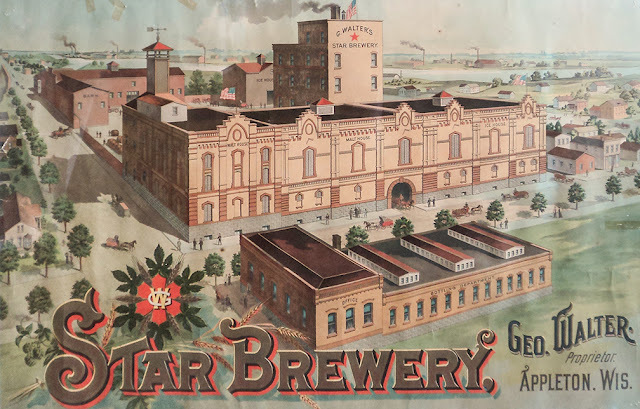 Unlike many German-American breweries, The George Walter Brewery did not have a beer garden or beer hall. They did, however, have a tap room at street level occasionally used by the employee’s and the general public who would come to the brewery to purchase beer. Wooden tanks were used at the brewery for aging and fermenting beer. These wood tanks were made of oak, cypress, and redwood. They were two and one-half inches thick and ranged in capacity from 70 to 200 barrels. In the early days, refrigeration was achieved through the use of cave and caverns built along the sides of the ravine located by the brewery. Beer was stored in these and other subterranean vaults beneath the brewery. Ice blocks covered in salt were commonly used to refrigerate the vaults and cool the beer kegs. The brewery had its own malt house and up until Prohibition produced its own malt. The owner, brewmaster and their maltsters generally lived in or near the brewery as their presence was always necessary during the brewing process. In 1918, at the request of the federal government, The Appleton Brewing and Malting Co. dissolved its holdings and combined with the George Walter Brewery. This was done as a war measure to save fuel and other materials. After the start of national Prohibition in 1920, the George Walter Brewery – like so many other breweries – made a near beer. It was named Bravo. This beverage was not very popular and the brewery closed after a few years. The space was then rented out to other businesses. With the election of Franklin D. Roosevelt in 1932, it was almost assured that Prohibition would be repealed. The brewery's Board of Directors met and discussed getting the brewery equipment back into shape for this expected repeal and started to once again brew beer. The brewery’s first beer since the beginning of Prohibition was sold on May 9, 1933. Tin over cardboard sign showing the first label used by the brewery after Prohibition. After Prohibition, a series of regulations and restrictions were enacted for the brewing industry. Two of these were The Brewers Code of 1933 and the Federal Alcohol Administration Act of 1935. These rules restricted the methods of selling and prohibited ownership and control over retail outlets. Before Prohibition, Walter Brewing had owned several pubs and retail outlets, and in general had lawful control over these establishments. With the passage of the new rules, the brewery was forced to relinquish these outlets. As a result, larger, distant breweries were given access to local markets like the one in Appleton. The use of motorized vehicles also had a significant impact on small breweries. Beer trucks were a more versatile alternative to trains for the distribution of beer, making it easier for big breweries to compete on the local level. A 1939 photo of the brewery workers and office staff. Upon the activation of the brewery in 1933, steel tanks were installed replacing the old wooden tanks. It was an important improvement. During the years following Prohibition, Appleton was noted for its excellent beer. A series of brewmasters were at the helm of the brewery after Prohibition. John Haug was the brewmaster until January 1, 1936, when Sigmund Linglebach assumed brewing duties. On June 11, 1936, Alex Knaus Sr. was hired as brewmaster. After the death of Knaus Sr. in 1942, Al Stierman took over brewing duties. Stierman tendered his resignation in November 1945 and left shortly thereafter. George Blessing then took over the position. Alex Knaus Jr. was appointed assistant brewmaster on May 14, 1946, and became brewmaster in 1949, a position he held until the brewery closed in 1972. 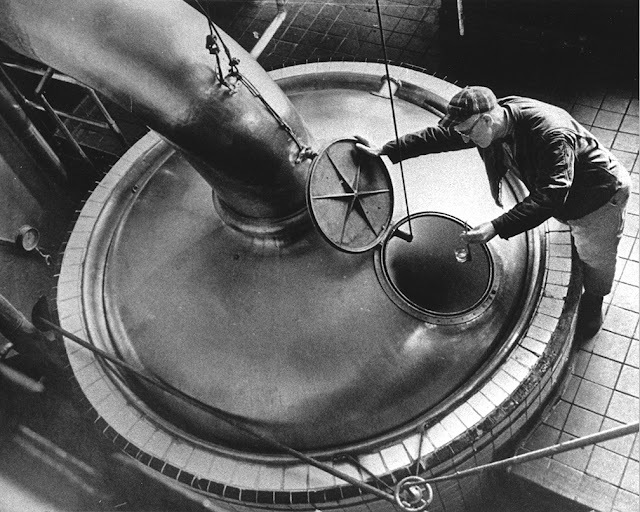 Alex A. Knaus, brewmaster from 1949-1972, at work in the brewery. The brewmaster is very important to a small brewery. He is the quality control engineer, production manager and chemist, all in one. Unlike large breweries that can afford specialists for each division, the brewmaster is the small brewery’s key man. He can use the recipe of his predecessor or devise his own. But at the end of the day, the reputation of a small brewing company is dependent on the product, work, and decisions made by its brewmaster. The first addition to the brewery in more than 30 years was a large garage built in 1934. In 1938, a bottle house was built and a large addition to it added in 1954. In 1939 the machine shop was built along with another large garage. The years 1954 and 1955 brought the addition of a canning line. This was forced upon the brewery by competition. It was too expensive to have been otherwise considered. A 34-spout Meyer Can Filler from Frankenmuth Brewing Co. was purchased. George Walter’s first beer in a can was brought out on April 1, 1955. In May 1956 an RCA Inspection Machine was installed which detected suspended solids in capped beer on the bottle line. This was another large investment. Prior to this, there was only one other RCA Inspection Machine in the state. A six-pack machine was added in late 1957. Later an eight pack machine for bottles was installed, again, to keep pace with what the brewery’s competitors were doing. The first Adler Brau eight-packs came out in the summer of 1962. Brewery workers with one of the brewery's delivery trucks. 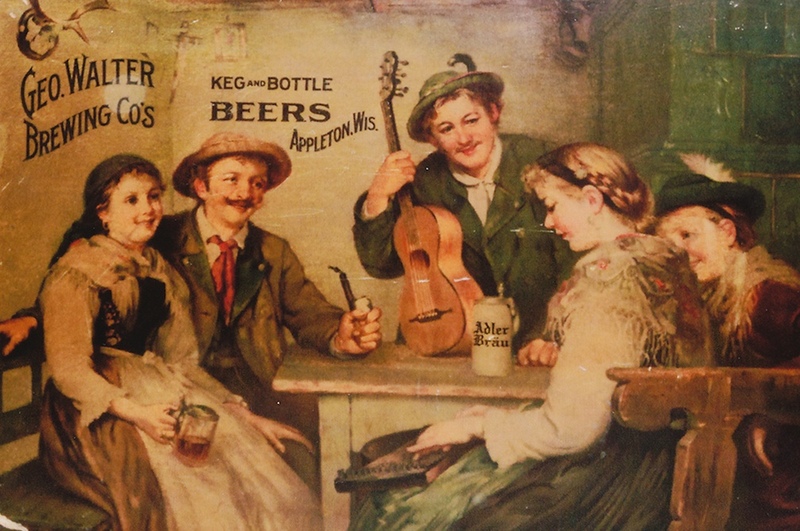 The years immediately following World War II were very successful for small breweries. This was due to the inability of big breweries to start full production and distribution immediately after the war’s end. The small breweries were able to step in and once again control the local market. The years 1947 and 1948 were the peak years of the George Walter Brewery with 52 employees and the highest yield of production, 50,000 barrels. The brewery normally averaged between 30,000 and 40,000 barrels per year. This photo shows the iconic Adler Brau bottle mounted on the front of the brewery. When the large breweries were able to ramp up production, they started to put the squeeze on the smaller breweries. Competition was the biggest hazard in the brewing industry. Competition was composed of three main factors. First, large breweries employed massive advertising campaigns. George Walter Brewing could not afford to compete on that front. 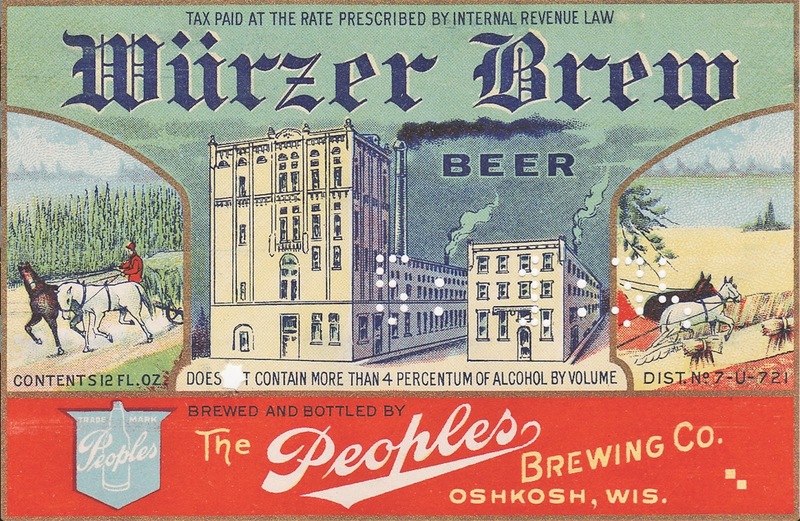 Second, the big breweries came out with cheap beer – such as Old Milwaukee by Schlitz – that competed with local brands. The arrival of Old Milwaukee had a definite effect on the sales of Adler Brau. Third, the large breweries had the economic advantage of size. They could brew more beer per employee using larger tanks. The result was a general loss of local patronage. 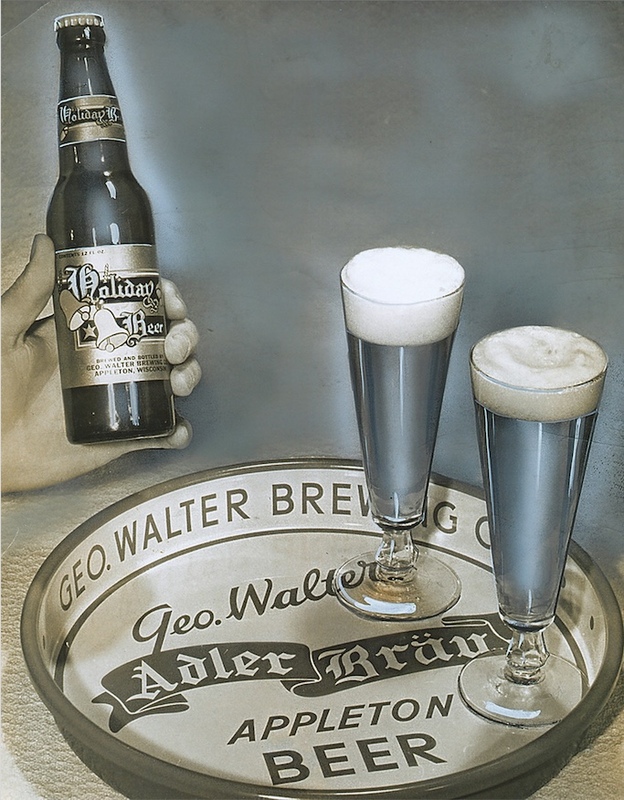 George Walter Brewing suffered a steady decline in sales and production with only a temporary comeback in the late 1950’s when strikes hit many of the larger breweries. Efforts were made in the 1950’s and 1960’s to counter the declining production. The brewery attempted many economic measures short of laying off employees. If workers retired, they often were not replaced. The existing employees doubled up on jobs. They economized in items such as fuel and had previously installed new equipment aimed at improving efficiency. In May 1962 the brewery held a big weekend party to celebrate 100 years in business. For this celebration, the truck garage was converted into a party room complete with bar and tables. The public was invited to attend. All the beer you could drink was available as well as pizza and hot beef sandwiches.The employee’s working the event sported a special bow tie that contained the words “Adler” on one side of the bow and “Brau” on the other side. In January 1966 the brewery began distributing Grain Belt Beer produced by Minneapolis Brewing Co. This went on until June 1971 when distribution was discontinued due to slow sales. In 1967, the brewery released a competitive light beer named Eagle Brew Lite Beer. The directors of the brewery hoped to use the new brand to expand the brewery’s distribution of its beer. Eagle Brew did fairly well. But the brewery ran into a problem with Meister Brau, which had trademarked the spelling of “Lite“. The Meister Brau Lite label was acquired by Miller in 1971. Miller introduced its Lite beer in 1973. It apparently was worked out that the George Walter Brewery could use up its stock of “Lite” labels. The brewery never used the “Light” spelling on its labels, but did use that spelling on its Eagle Light printed beer cases. There is only one advertisement for George Walter’s Eagle Brew Lite known to be in existence where the spelling is Lite. This is a small cardboard sign 11 X 14 inches. These signs were used in sales outlet displays. George Walter’s self-distributed its beer within a 50-mile radius of Appleton. Competition was especially tense in Green Bay and Oshkosh, where there were other breweries. The brewery advertised in the Appleton area through newspaper ads, radio, billboards, city buses and through its numerous sponsorships of local activities. For a small brewery, the George Walter Brewery put out a vast amount of immensely varied advertising. By 1970, the brewery was struggling to survive. On September 10, 1971, Roland Marx – the brewery’s secretary, treasurer and general manager – placed an ad in the Appleton newspaper that stated, “we need a 20% increase in business NOW” to keep everyone employed. Unfortunately, this didn’t get the desired result. At a stockholders meeting on January 25, 1972 shareholders overwhelming approved of a motion to dispose of the brewery. They also agreed to make every effort to sell the brewery as a total package to maximize the sale price. Meanwhile, the brewery continued to produce its Adler Brau, Eagle Brew and Holiday Special beers. On January 29, 1972, the Appleton Post-Crescent reported that the George Walter Brewery would close if not sold. The article stated that the brewery would place ads in national trade journals announcing that it was seeking a buyer. Less than a month later, a second article appeared in the Post-Crescent stating that the brewery would be purchased by an investment group headed by George M. Walter, President of the Walter Brewing Company of Eau Claire. The paper reported that the brewery would remain in operation. 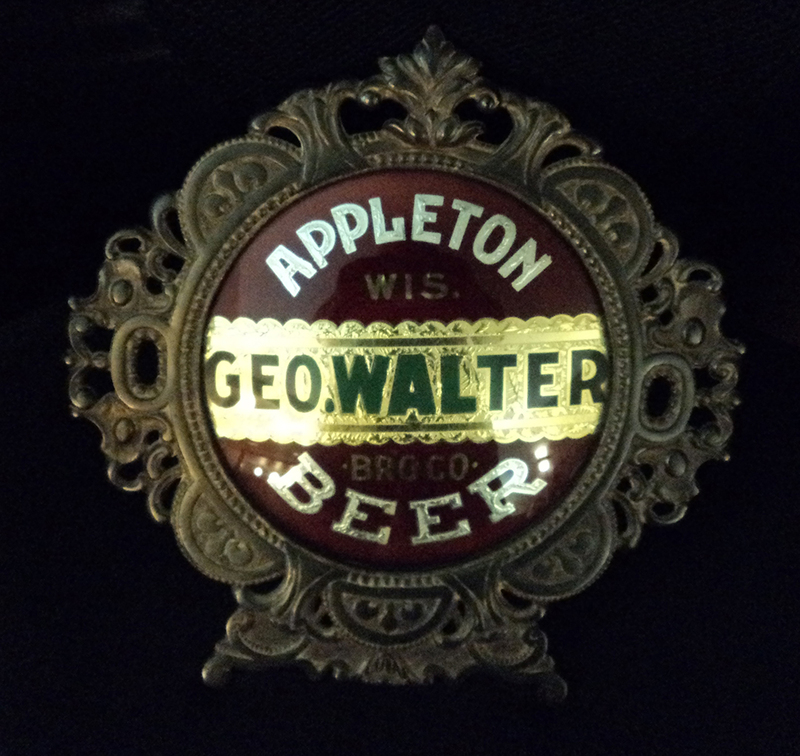 George M. Walter was the grandson of the original George Walter of Appleton’s George Walter Star Brewery. Others in the Eau Claire group included Edgar Walter, the youngest son of the original George Walter’s nine children, Edgar’s three sons: Dr. Karl Walter, John Walter and Bill Walter; and Ted Heid and Paul Dohr. On March 21, 1972, the Eau Claire investment group took over the brewery. Its new officers would be Ted L. Heid, President and General Manager; Edgar B. Walter, Vice President; and Paul Dohr, Secretary/Treasurer. The familiar red ribbon that had been in used prior to 1966 returned, but the beer behind the label had changed. 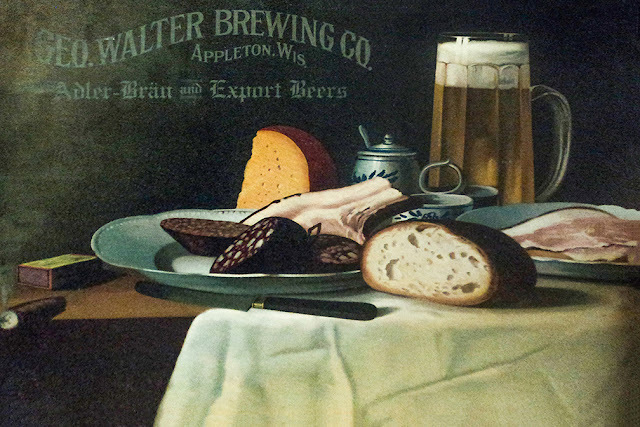 The new recipe for Adler Brau was from the Eau Claire Walter’s Brewery. This recipe was made up of less grain, more water and less brewing time. The new beer was scheduled for release on May 1, 1972. The new brewmaster was Clarence (Dutch) Van Handel. Dutch had been the assistant brewmaster until 1952 when he went on the road as a goodwill man for the brewery checking in on taverns where the beer was served and occasionally catching a round for local patrons. At the time of the buyout, the investment group was going to purchase the brewery for $100,000. 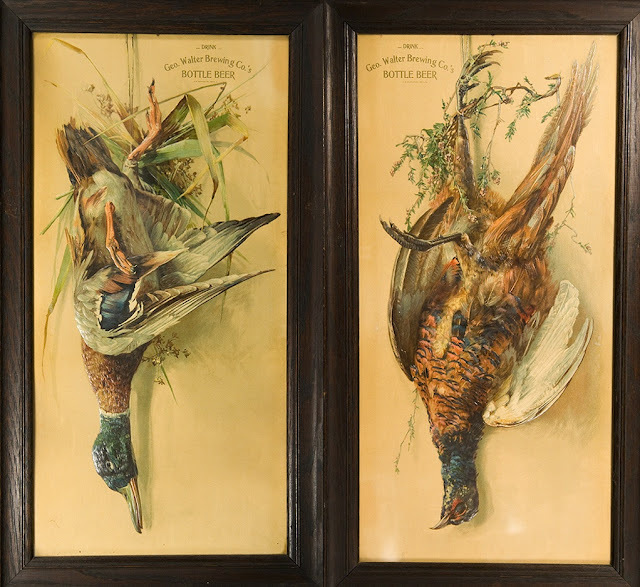 This is the same amount that the original George Walter’s estate was valued at the time of George’s death in 1899. After each investor put in $10,000 they capitalized at $70,000. The remainder was to be paid off in a note from a bank. Each investor was going to share in the $30,000 bank note but backed out. This left Paul Dohr and Ted Heid to sign for the bank note. After the February 25, 1972 article appeared in the paper, several stockholders of The George Walter Brewery showed displeasure in the buyout proposal. They considered the sales price too low. Upon hearing this, Roland Marx (Rollie), the brewery's secretary, treasurer and general manager, contacted Appleton attorney Les Chudacoff. After their meeting the following information was revealed: Even though the investment group now owned the brewery and beer was already being brewed, a majority rejection vote by the George Walter Brewery stockholders would render the buyout null and void. Stockholders, subsequently voted to reject the buyout offer. The brewing of Adler Brau Beer discontinued on April 7, 1972. The beer that remained in the storage cellars was poured down the sewers. The brewery closed for good on April 27, 1972. Chances are that if the February 25, 1972 article had never appeared in the paper tipping everybody off about the sale, it is quite possible the brewery may have survived for several more years. After the brewery closed in 1972 the property and brewery complex was put up for sale. In November of 1972 it was offered to the city of Appleton as a site for the new Appleton Police Department. After lengthy negotiations, the brewery property was sold to the city in July 1973 for the sum of $125,000. In February 1974 the corporation of The George Walter Brewery was dissolved. In 1989, the building in Appleton that originally housed The Appleton Brewing and Malting Co. underwent an extensive remodel. It became The Between the Locks Mall. One of the owners – John Jungers – purchased brewing equipment to start a micro-brewery there. His micro-brewery opened for business on August 3, 1989 as The Appleton Brewing Co.
Because the George Walter Brewery had been out of business since 1972, the Adler Brau name was no longer a copyrighted trademark. Jungers was able to acquire and use the Adler Brau name. 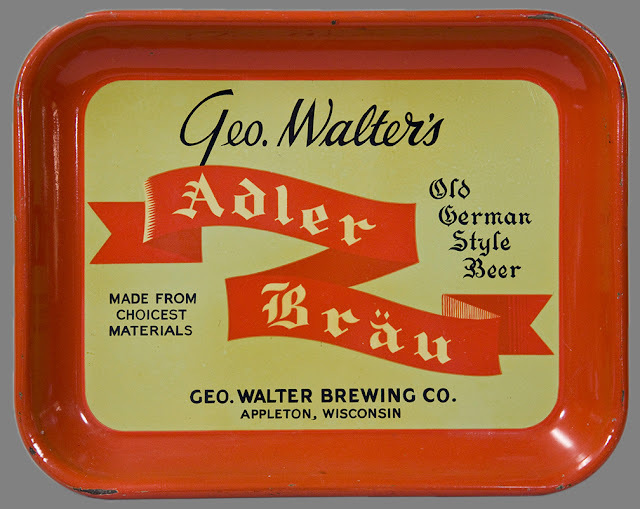 A number of former employees from the original George Walter Brewery were very unhappy about Jungers using the Adler Brau name. They felt he was cashing in on a brand they had worked to build. Although Jungers produced several quality craft beers, none of them had anything to do with the original beer or recipe of the George Walter Brewing Company. Jungers’ beer, however, did win several awards at the Great American Beer Festival in Colorado. 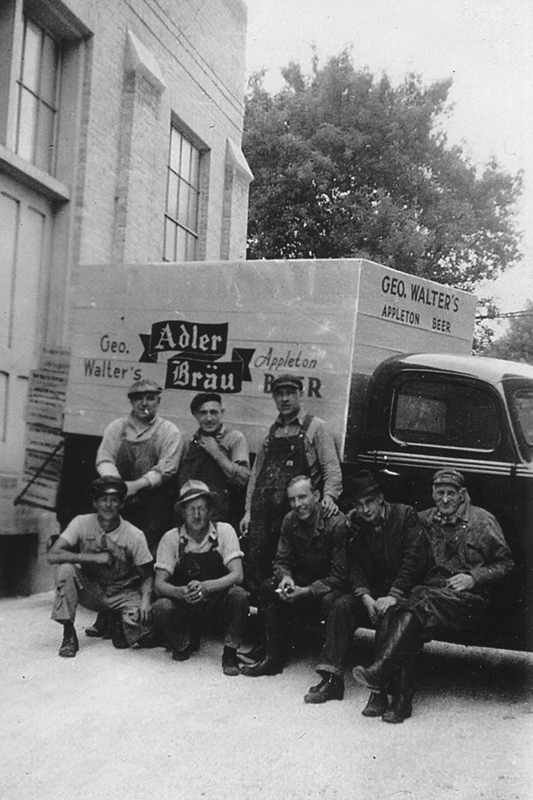 Jungers tried several times to get the original Adler Brau Beer recipe from Alex Knaus, the last brewmaster at the George Walter Brewery, but Alex would never give it to him. Although Alex and I became great friends in the years before his death, he would not give his recipe to me either. In the end I chose to stay neutral as I could see both Alex’s and Jungers’ reasoning. In the fall of 2004, father and son partners, Tom and Steve Lonsway bought The Appleton Brewing Co. from Jungers. The Lonsways continued to run it under that name until after the first of the year when they changed the name to Stone Cellar Brewpub. Brewmaster Steve Lonsway took the brewpub’s beers in a different direction, specializing in English-style ales. The Lonsways have an excellent restaurant on premises and strive to be as eco-friendly as possible. They have spearheaded the local movement in offering organically grown vegetables and humanely harvested meats and cheeses. In the summer of 2008 Steve approached me and asked if I might have a copy of the original Adler Brau beer recipe. He wanted to do something special for what would have been the 150 year anniversary of The Appleton Brewing & Malting Company. Alex Knaus had never given me the Adler Brau recipe he used in his years as brewmaster. I had, however, come into possession of an original brewmaster’s ledger from 1946 when George Blessing was the brewmaster. The Adler Brau beer from the 1946 recipe will be an occasional guest beer or one for special occasions. It is not always on tap. When Stone Cellar Brewpub expanded into the off-premise sales market they were refused the trademark Stone Cellar because of a nationally available wine. They then proceeded to trademark the name Stone Arch and now market their product as Stone Arch Hand Crafted Beers. The bar, restaurant, beer garden, and newly added tap room continue to grow in popularity. Stone Arch does retain the rights to the Adler Brau name. A restored reverse on glass sign with neon. 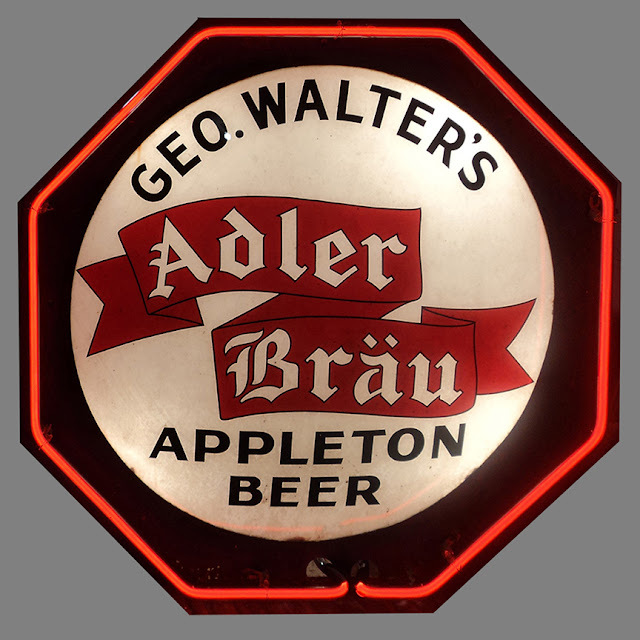 Adler Brau neon signs first appeared in 1946. The first neon signs consisted of just the words Adler Brau Beer in red. In the late 1950s, the neon was changed to include the offset rectangle that was starting to be used at the time and was later in use on the silver can mentioned above. This offset rectangle on the neon was made out of a neuville gold colored tubing. The Adler Brau words continued to be red but the word beer in most cases was done in green. Throughout the breweries existence they sported 5 different clocks and nine different beer trays. These trays started in the very early 1900’s and remained a staple until the end. The first tray put out by the brewery after Prohibition. Advertising for Holiday Beer. Tray shown is the third, round tray used after Prohibition. The brewery also had many different calendars, pens, ashtrays, tab knobs, glassware and a ton of different paper advertisements. They had 2 different tin over cardboard signs, 3 different thermometers, 2 different mirrors, lighted indoor and outdoor signs and many other items. Reverse on glass advertising sign. Lighted sign showing the label that appeared on the first can used by the brewery. This is the brewery's only motion sign. Just 25 of these signs were produced. George Walter’s first beer in a can was brought out on April 1, 1955. This was a gold can which showed a square that was tannish-cream in color. The next was a gold can that was basically the same, but with this can the tannish-cream color square was changed to white. These two cans showed the famous Adler Brau ribbon that flared down on both ends inside of the colored square. In July 1961 Adler Brau came out with a silver can. This can had limited tops: one imprinted with the words “Don’t be a litterbug” the other with “Holiday Beer”. This can also had a plain top and later became the first can the brewery put out with a pop top. The can featured an offset rectangle where the brewery had previously used a colored square. 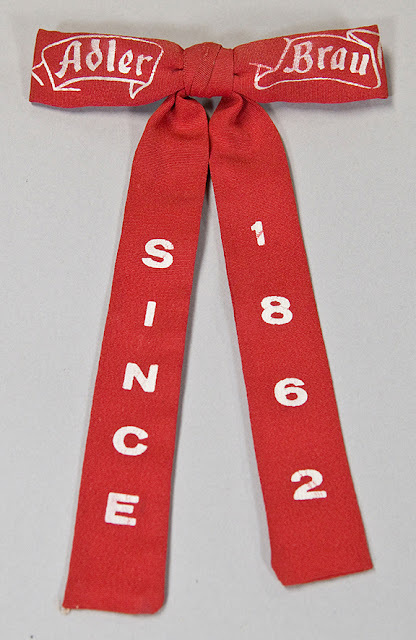 It also showed the change in the famous red ribbon that now flared up on the right side only. There is also a silver can in existence that has the design of the earlier gold can. It is believed this particular can may have been a test can shown to the board of directors to vote which can the brewery would now go with. In late 1965 at a Directors meeting two new different cans were shown to replace the silver can. A white can with an eagle was voted down. The second can was a tomato reddish-orange can with an eagle. This can was chosen but was soon replaced with the same version but the color was changed to a darker red with the eagle. Thereafter, the beer was often referred to as Eagle Beer or Screamin Eagle. In German, Adler Brau meant eagle beer. This Screaming Eagle reference was brought up during a discussion in a November 1969 stockholder meeting. When I was first approached about contributing an article for the Oshkosh Beer Blog I was unaware of what the blog even was as I had never seen it. As I looked it over, I decided it was something I would like to be involved with in a small way. Let me start by introducing myself. My name is Brian Zenefski. Many people refer to me as The Adler Brau guy. 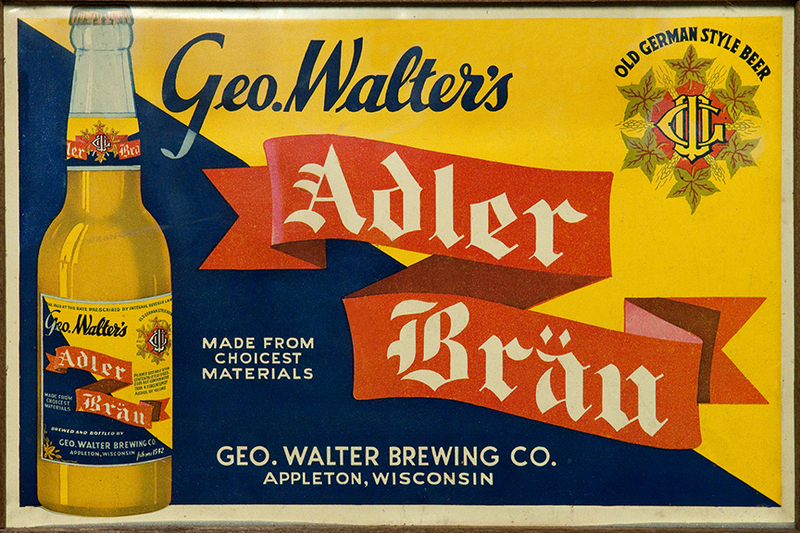 This is because of my thirty-plus years of seeking out factual information about the former George Walter Brewing Company in Appleton Wisconsin, the brewers of Adler Brau beer. 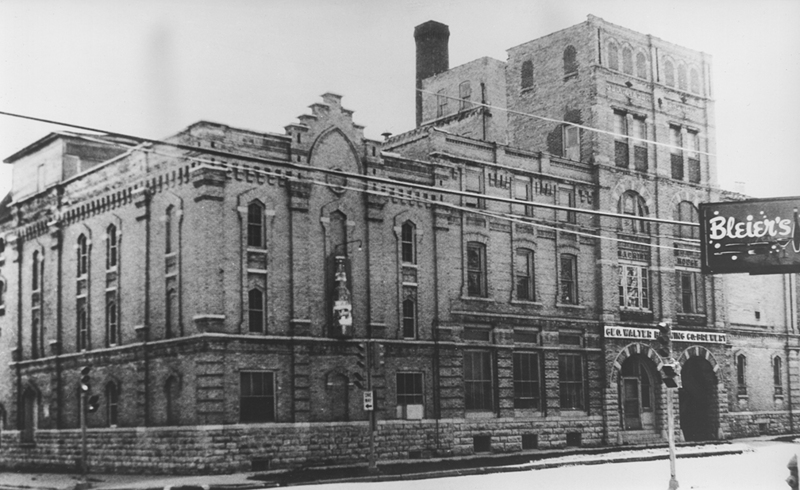 The brewery was located on the site now occupied by the Appleton Police Department. 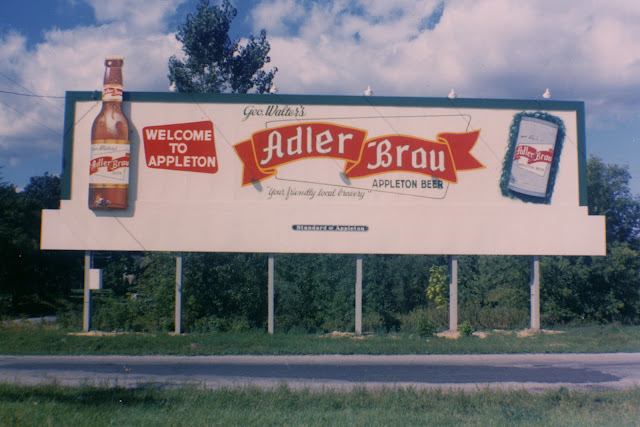 This brewery’s Adler Brau beer had nothing to do with the microbrewery in the Between the Locks Mall in Appleton that acquired the rights to the Adler Brau name in later years. I became interested in brewery related advertising as a very young boy. This is in part because I would enjoy the beer ads on TV. The on-going antics of the Hamm's bear as the theme song played "From the land of sky-blue waters and end with the words Hamm's the beer refreshing, Hamm's." I also enjoyed seeing the Blatz can, keg and bottle dancing around to the words " I'm from Milwaukee and I ought to know, it's draft brewed Blatz Beer where ever you go." During that period of time there were many different commercials for many different beers, many brands now no longer available. It was also at this time I would be fascinated with the many different lighted signs I would see on many different establishments inviting people in to enjoy a fresh cold brew that as a young boy I was forbidden from entering. As I grew older and started collecting, I bought anything and everything, thinking that any kind of breweriana advertising was very difficult to acquire. As time went on I became aware of the many different advertising shows and of the organizations available to collectors. When this happened, my focus on collecting also changed. I then started to acquire Budweiser, Stroh’s, and a lot of Miller High Life breweriana. As more time passed, my interest in the former George Walter Brewery was aroused. I would acquire an item here and there, and as I continued to add to my George Walter collection I sold off most of my former collection to make room. As my Walter collection grew, so did my curiosity about the old brewery, which by this time was long closed and had been torn down. The George Walter Brewing Company was in business for 110 years from 1862 until 1972. When seeking information about the brewery I went to the public library which had little on the subject. The local historical society was also a bust. The Castle Museum in Appleton had a few items but no historical account of the brewery. As my quest continued, names of former employees would periodically be mentioned to me. I would track these people down and talk with them. As this continued, I learned of many more former employees I would then contact. As word got around about what I was doing, many of the former George Walter Brewery workers contacted me as well to share their memories. When talking with these former employees there were two names consistently mentioned. One was Rollie Marx who had been the secretary, treasurer, and general manager of the brewery. Although the brewery had a president by the name of Henry Rossmeissl, in all my years of research I have never been able to find out what the president actually did. I became good friends with Henry’s son Matt, who also worked in the brewery and asked what his dad did as president. His reply was that he didn’t know either. While Matt was working at the brewery he had also been the last recording secretary of the brewery’s union. Rollie Marx basically ran the breweries daily operations and was the one person that did everything from ATF label-approval certificates to negotiating labor contracts between the brewery and its workers. At the brewery’s end, Rollie also negotiated the sale of the brewery property to the city of Appleton for the future Police Station. In all my years of research, I have never heard a single negative word spoken against Rollie. Everyone thought very highly of him and those feelings have continued on to this day when I speak with people that knew him. Unfortunately, Rollie passed on before my interest came to be; although I did have the pleasure of meeting his wife Mae before she passed. I also became friends with his sons and have learned more about the brewery as they had helped their dad in the brewery. The second name that would be mentioned to me was Alex A. Knaus. Alex was the last brewmaster for the George Walter Brewery. 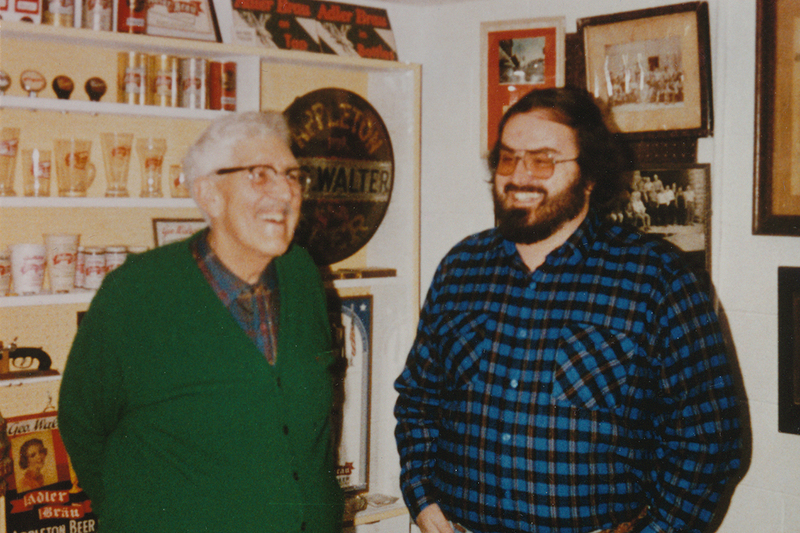 He was the brewmaster there from 1949 until the brewery closed in April 1972. Although Alex in later years was also the plant superintendent, he reported to Rollie as well. When searching for Alex I found he had an unlisted phone number. People I talked with about the brewery would periodically see him, but no one knew where he was living or had his phone number. Over the next two years, although I did not put a concentrated effort into locating him, I would at times try to seek him out. It is only because a friend of mine had a book from a local church which contained pictures of its congregation that I came across a picture of a man I would see walking by where I was living at the time. This man’s name was listed as Alex Knaus. I learned it was the Alex I had been looking for. Imagine my surprise when after all the time I had searched for Alex I found he lived one and a half blocks away from where I lived. The next time I saw him I introduced myself and from that time on we became great friends. We not only talked about the brewery but we often got together for dinner and would do many other things together non-brewery related. Brian Zenefski (right) with Alex A. Knaus in 1990. In November of 1990, after knowing Alex for several years I finally talked him into sitting down and having a detailed conversation about the brewery that I recorded. Alex opened up and talked for 1½ hours about everything related to the brewery. It was quite informative to hear about the daily goings on in brewery life and related topics. I was fortunate to have gathered this information when I did because Alex passed on February 13, 1991 after a very short illness. Most of the article included with this introduction I originally wrote for and was published in the Nov/Dec 2010 issue of The American Breweriana Association Journal. When I originally wrote this article I had requested this specific issue of the ABA Journal as I wanted to show the Christmas related advertising that the brewery had as I had never seen this done in any prior issue about any brewery. The Christmas advertising used in that ABA Journal article is not included in this write-up. Some of the formatting has also been changed. I was able to write this article accurately because of the many close friendships I developed over many years with many of the former employees of the brewery. It was also made possible with the help of two of the original members of the investment group that were going to purchase the brewery at the end. I also had available to me all the board of director minutes of the meetings from 1903 when the brewery incorporated until the corporation was dissolved in 1974 two years after the brewery closed. I also had access to some of the original brewery union records. The original lawyer’s records pertaining to the brewery were available until recently when they were destroyed. I will forever be grateful to all the friends I made throughout this journey who opened their hearts and homes to share their memories of the brewery with me. Many of them were former employees of the brewery. Many others were people that were hired by the brewery to do various tasks for the brewery. My thanks go out to the many people who shared their memories and photographs with me of the George Walter Brewery and related advertising pieces. My thanks go out to Susan (Weber)Beula and Gary Degoey for their assistance with the preceding article. Also many thanks to Damon Digital Services for the great photo work. Such a great story and dedication to preserve history on local beer. We would really like to have you, Brian and Lee to do a presentation for us on Alder Brau and the brewery. Right now, I don't think Brian is quite up for it, but who knows, maybe one day. Thanks for sharing this great piece of history. Thanks, Randy, Brian and I have been working on this one for a while, I'm glad it's finally out there. Many thanks to Brian and Lee for taking the time and years of energy to make this historic post possible. Fantastic work. Just think that today a 30,000 to 40,000 barrel regional craft brewery would be labeled small to medium sized. Geo. Walter and similar Wisconsin breweries like Walter's in Eau Claire, Schoen's in Wausau, Potosi, Breunig's, Peoples, and yes Chief Oshkosh were all caught in a dead zone of one dimensional taste and price. So hard to figure these days how folks would turn their noses at Adler Brau just to have Old Milwaukee at 50 cents per case cheaper. Clarification by the author Brian Zenefski. The part of the article in which I refer to the cans I state the order of the cans as they were put out by the George Walter Brewery. This is correct. The white can shown in the picture of the 5 cans was a test can that was never used as stated. The picture with the caption below that states "This is a lighted sign which shows the label that appeared on the Brewery's first can" was an oversight on my part. It was actually the second can put out by the brewery. The first can had the cream colored square. I wanted this oversight addressed here to clear up any doubts for can collectors or anyone else that may have noticed this contradiction. Excellent work Brian. I feel like I should get at least two credits after completing this course on the George Walter brewing company. Maybe I'll just have a beer instead. Lee, can you please recommend a current beer that would taste similar to a 1950s version of Adler brau holiday brew? I'd like to read Brian's piece again while drinking it. Dave, that’s a great idea! I’d recommend Leinenkugel’s Original. I’ve seen the Adler Brau recipe from 1946. It definitely had some hop bitterness to it and those hops were Cluster. I’ll put a link below, where you can see that Lienie’s fits the bill as far as that goes. I would think that Adler Brau would have been quite similar it. Thanks, Brian, I appreciate that. I enjoyed working on this with you! Thanks to Brian and Lee for the effort in putting together this page. I am the great-grandson of Henry Rossmeissl and nephew of Matt Rossmeissl (both of whom are mentioned in the article) and have a keen interest in the history of the bar. The photos are very interesting - note that in the picture of the brewery you can see the sign for Bleier's Tavern - the bar owned by the father of Pittsburgh Steeler and War Hero Rocky Bleier. Great to hear that you found this. Thanks for reading! I am also part of the Rossmeissl legacy. Who are you? Great article and "thanks". My grandfather worked there and my father drove a delivery truck for them as well. I have some items such as beer trays, can opener, cardboard boxes, etc. I have fond memories of going to see my grandfather at the brewery as a young boy. Who was the last president of the brewery when it closed? I want to thank you for bringing forth the wonderful history of my great great grandfather ...i have heard this history from my father and grandfather...but to hear it from another and read it and see pictures is just a great experience. birthday celebration in January and i absalutlely fell in love with the taste..i am not a big lager fan ...but this was smooth and had a wonderful flavor...couldnt be more proud to be apart of this legacy.